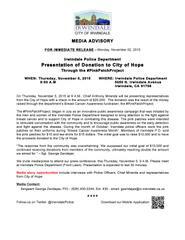 On Thursday, November 5, 2015 at 9 A.M., Irwindale Police Chief Anthony Miranda will be presenting representatives from the City of Hope a check in the amount of $20,000. The donation was the result of the money raised through the department’s Breast Cancer Awareness fundraiser, the #PinkPatchProject. The #PinkPatchProject, began in July as an innovative public awareness campaign that was initiated by the men and women of the Irwindale Police Department designed to bring attention to the fight against breast cancer and to support City of Hope in combating this disease. The pink patches were intended to stimulate conversation with the community and to encourage public awareness on the early detection and fight against the disease. During the month of October, Irwindale police officers wore the pink patches on their uniforms during “Breast Cancer Awareness Month”. Members of Irwindale P.D. sold the pink patches for $10 and tee-shirts for $15 dollars. The initial goal was to raise $10,000 and to have the proceeds donated to the City of Hope. We invite media/press to attend our press conference, this Thursday, November 5, 9 A.M. Please meet at Irwindale Police Department (Front Lawn). Presentation is expected to last 30 minutes. The public and members of the community are also invited to attend. Media story opportunities include interviews with Police Officers, Chief Miranda and representatives from City of Hope. This advisory has been sent by the Irwindale Police Department as a community service bulletin. Download the Irwindale Police Department Mobile App for your iPhone, Android and Windows Mobile phone. Visit your app store and search "Irwindale Police"